We designed our dental website to provide convenient information about our philosophy, dental practice, dental procedures, and patient education.Our goal is to work with you to achieve the best oral health, the most beautiful smile, and the most favorable dental experience possible. At our Westside Center we offer a wide range of periodontal, implant and cosmetic services. We welcome you to our practice and value your business tremendously. We realize that you have many choices and we appreciate that you have given us the opportunity to provide you with caring and state of the art treatment. In an effort to serve you more efficiently we ask that you fill out attached forms and bring them to your initial appointment. We ask you to please bring any medical and dental insurance information to your initial consultation. If x-rays have been taken in the past year, please make arrangements to have them available during your visit. Remember to bring your insurance card, referral forms from insurance and your doctor to expedite your treatment planning and billing. Since periodontal and dental implant surgery may sometimes take more time than expected, please allow ample time for treatment on the day of your appointment. Dr. Afar will perform a comprehensive exam with oral cancer screening. 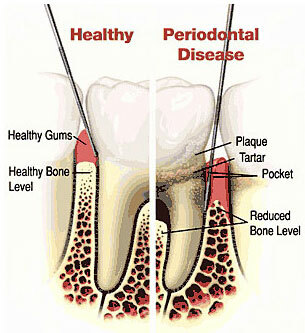 You will be educated about periodontal disease and have the opportunity to ask any question you may have. A return treatment plan will be presented to you with alternatives. We arrange for insurance preauthorization, however, you will be ultimately responsible for services rendered. To better understand periodontal diseases and treatment you need to know the anatomy of the tooth supporting structures. They include the periodontal ligament which attaches the tooth roots to the interdental bone (socket) and the gum tissue which attaches to the bone and surround the tooth neck like a collar. The word periodontal literally means “around the tooth.” Periodontal disease is a chronic bacterial infection that affects the gums and bone supporting the teeth. Periodontal disease can affect one tooth or many teeth. It begins when the bacteria in plaque (the sticky, colorless film that constantly forms on your teeth) releases toxins causing gum inflammation. This causes the gums to swell, appear puffy and bleed easily .This early stage of gum inflammation is called gingivitis. There is usually little or no discomfort. Gingivitis is often caused by inadequate oral hygiene. Gingivitis is reversible with regular professional treatment and good oral home care. Untreated gingivitis can advance to periodontitis. With time, plaque hardens to form tartar and begins to grow below the gum line detaching the gums from the tooth. Toxins produced by the bacteria in plaque stimulate a chronic inflammatory response causing bone resorption. Gums separate from the teeth, forming pockets (spaces between the teeth and gums) that become infected. As the disease progresses, the pockets deepen and more gum tissue and bone are destroyed. Often, this destructive process has very mild symptoms. Symptoms include bleeding gums, bad taste in the mouth, halitosis (bad mouth odor) and in severe cases abcesses. Eventually, teeth can become loose and may have to be removed.